I have been getting more involved in making tasty smoothies for my breakfast and after workout snacks, and while trying different flavor combinations, I stumbled onto this easy banana oat smoothie that has quickly become my favorite. I use a vanilla whey protein powder in my smoothies, but you can use whatever protein powder you prefer. I find the oats in this smoothie really help to hold you over and make it a very satisfying meal. When my bananas become too ripe, I always peel them, cut them up, and freeze them to use in smoothies such as this one as the frozen banana really helps to thicken the smoothie. Light almond milk is high in calcium but low in fat and calories. 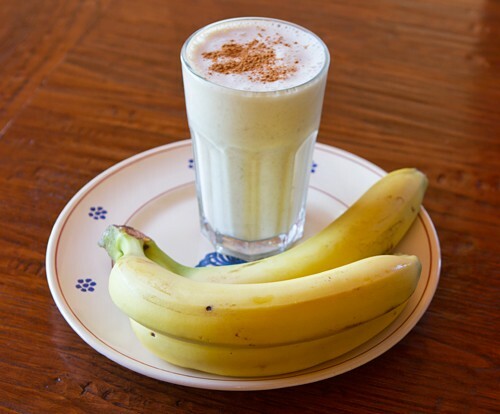 A satisfying spiced banana smoothie that works well for breakfast or for an after exercise snack. Place all the ingredients in a blender or juicer and puree until smooth and thick.